Some hotels are beginning to get a bit more creative with their minibar contents, and are including local, organic, homemade and/or quirky, fun items in their minibars. A few hotels that offer some of these unique hotel minibar services include; the Nikko, San Francisco, which offers a selfie stick in their minibar service. Pier One in Sydney Harbour that has a special minibar for your fur babies, which includes a selection of jerky, toys and treats. The Rocco Forte Hotels in Europe, which has said “goodbye” to the candy and soft drink and “hello” to healthy alternatives such as kale chips and quinoa crackers. They also offer customizable minibars, with vegetarian, vegan and gluten-free minibar options. The Renaissance Paris Republique Hotel has included pepper and dried tomato-coated grasshoppers to their minibar menu. And, finally, the Kimpton Sky Hotel in Aspen offers mini oxygen tanks in their minibar service. Most hotels charge heavily inflated prices for items in a hotel minibar – think $10 for a bottle of water. The price for each item is usually (but not always) listed on a minibar menu in the hotel room. 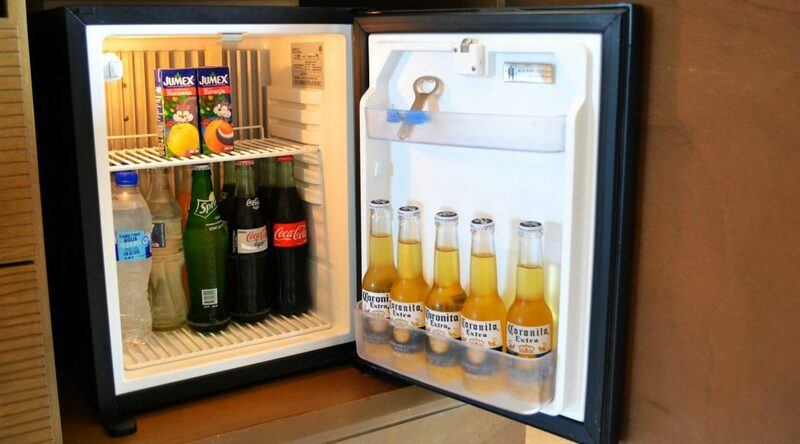 There are however an increasing number of hotels that are including the minibar and it’s items for free. A few of these hotels include, the Park Hotel Vitznau on Lake Lucerne in Switerland, The Guesthouse in Vienna, Austria and the Auberge du Soleil in California’s Napa Valley.